The testo 310 residential combustion analyzer sets a new standard in affordable flue gas analysis with its rugged housing, simple design, and advanced sensor technology. With five different fuels to select from, it provides the flexibility you need for applications like checking furnace efficiency, boiler tuning, and water heater checks. Fully featured and priced right, the testo 310 residential combustion analyzer provides exceptional value and complete capabilities in combustion testing and furnace efficiency. With its ability to perform both basic and more complex flue gas analysis, maintenance, safety checks, and furnace efficiency confirmations, the fully featured testo 310 residential combustion analyzer delivers plenty of combustion parameters. The stainless steel probe and cone-stop are perfect for residential and boiler efficiency applications. 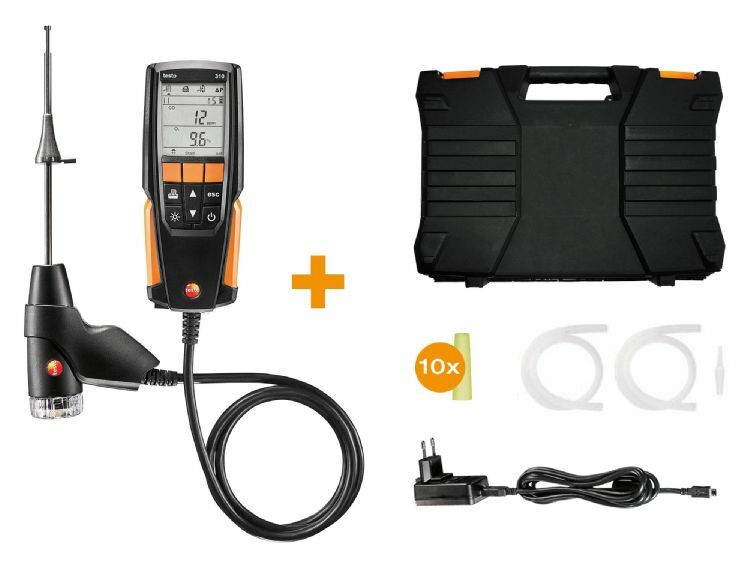 The testo 310 can be used for accurate heating adjustments, so you can get it right the first time, and every time. With five different fuels to select from (natural gas, propane, fuel oil 2, biomass 5%, and wood 20%), it provides the flexibility you need for all your tuning needs. With an optional printer kit available, you can keep records of all readings taken.